FTWW would like to thank Em for her take on the 2017 EndoMarch. Em is a much valued supporter of FTWW’s work. She lives in North Wales. Our fabulous EndoMarch graphics & posters, huge thanks to www.madamadari.com! “I have a disease. A little known disease that has had a massive impact on my quality of life. Thousands of women across Wales also have this disease, and suffer the consequences. Yet it remains a hazy, often misunderstood, vague disease. Little evidence-based research, information and training is available to the very doctors and surgeons who treat us with powerful drugs, cut us open and operate on us, let alone the general public. ‘In 2016, my endometriosis was having an awful effect on me. My options for treatment were extremely limited, and I had very little faith in the professionals who treated me. I was fortunate that by chance I came across a third sector organisation called FTWW, and I nervously made contact, hoping against hope that at last someone would be able to help me, or at least understand my condition. ‘FTWW is an entirely voluntary, third sector women’s health and equality organisation supporting me and hundreds of other women in Wales. ‘Through their untiring work, they have already successfully lobbied Welsh Government to change strategy for endo patients. ‘FTWW helped me so much I can’t put into words. To belong to this group of warriors and survivors, to be able to exchange my story, to support others and be supported, to know that someone was in my corner, fighting for me helped me more than words can explain. I went from fighting in the dark on my own to fighting with an army of bright yellow clad warriors behind me. But we are still fighting. And we shouldn’t be. We need to raise awareness, there’s lots to do. ‘On March 25th 2017, all around the world, EndoMarches took place. 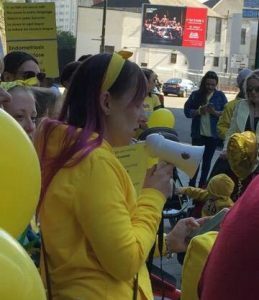 From Canada to Germany, China to Brazil, women and their supporters marched to demand justice and fair treatment for Endometriosis sufferers, to raise awareness of this debilitating, woefully under-resourced disease. Team Wales Captain Niki motivating the troops with her rousing speech! ‘In our little corner of the world, EndoMarch Wales was organised by Niki Dally, Team Captain for the Welsh leg of the Worldwide EndoMarch. The event was officially endorsed by the Welsh Secretary for Health, Vaughan Gething, and Assembly Member, Hefin David. 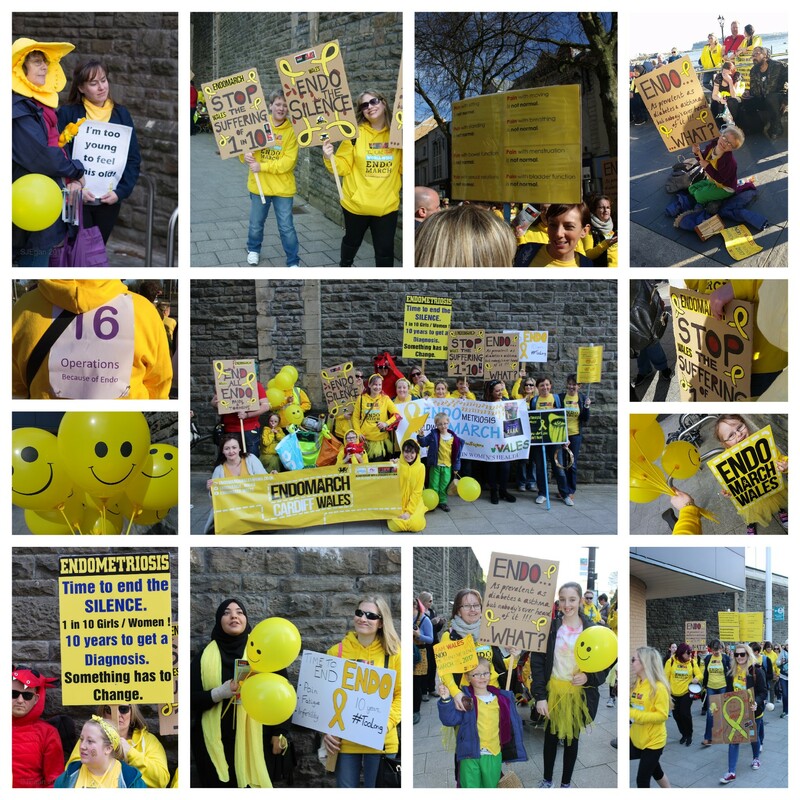 ‘EndoMarch Wales turned Cardiff bright yellow by providing banners and balloons for the marchers. Everyone who marched was also tasked with distributing as many endo information leaflets as was possible to the public we met on the way * . In order to make it as easy as possible for women to get down to Cardiff from the North, FTWW also provided a minibus. The journey was almost five hours each way. That’s how determined everyone was. That’s how important it is. Some of the amazing banners & placards! 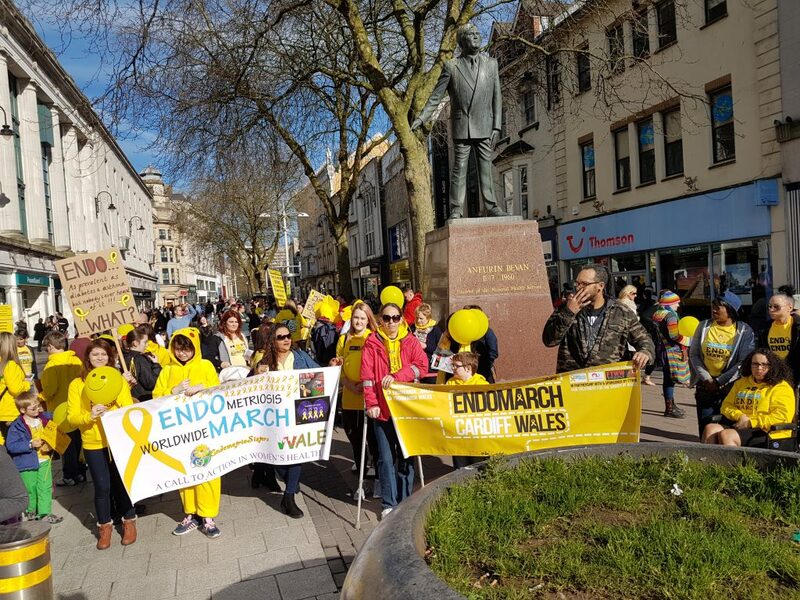 ‘Armed with our balloons, endo leaflets and banners, my family and I joined hundreds of other women and their supporters to march 2 miles from the centre of Cardiff to Cardiff Bay, culminating at the Senedd. 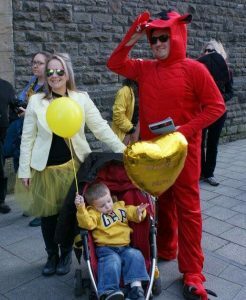 ‘My husband was so keen to draw attention to the plight of women in Wales, that he even donned a full-length Welsh red dragon costume, which he wore for the entire march! At the end of the walk we were serenaded by the Treharris Choir of Light and treated to an artisan cake made by FTWW member, Annie Thomas. ‘Although I had met before with several of the North Wales members of FTWW, I knew very few of the ladies who marched. Yet by the end of the march I had made friends, I knew their stories, and they knew mine. I didn’t feel so afraid any more; I didn’t feel so alone. I had met people with a common issue and perhaps, more importantly, I had given out leaflets, and talked to so many members of the public, I was hoarse at the end of the day. We all were. The EndoMarch gave us a platform to be heard. To push this unknown disease to the forefront of people’s minds, if only for the few minutes they saw our banners and read our leaflets. 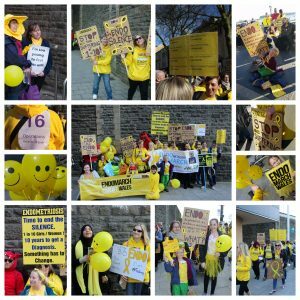 The EndoMarch gave us a collective voice, and a sense of power, which is a huge contrast to the powerlessness and isolation many endo sufferers feel. The air was electric. There was hope. Watch us in action here! ‘For many of us, the damage done by Endometriosis (and sometimes the treatments we endure) is permanent. For too many, fertility and the time wasted in fear and anxiety is lost, as is the time spent on the operating table, and the days, weeks, and months of recovery from operations. ‘We weren’t marching just for ourselves. We were marching for our daughters, our younger sisters, our nieces, and all the other little girls who might one day be saved from the impact of this disease. ‘For some of us there is hope. By raising awareness, by marching, by protesting, and by making a nuisance of ourselves, we will eventually be heard. Due to the phenomenal efforts of our representatives like Debbie and Niki, we may be able to access new treatments, ground-breaking research might be done. Some of us may get better, we may eventually get the support we need and deserve. Aneurin Bevan Supporting Team Wales! ‘Because we march, we shout, we are heard. Here’s to EndoMarch Wales, Saturday 24th March 2018! 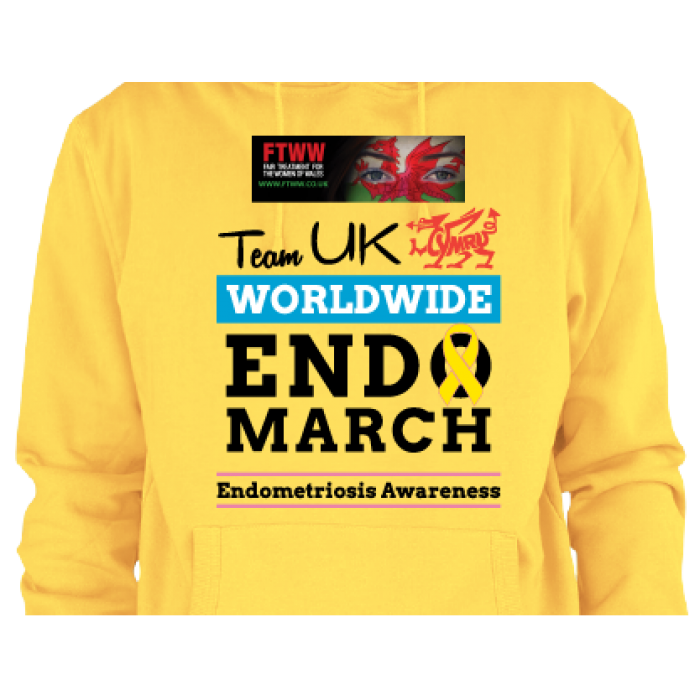 * EndoMarch Wales was organised in partnership with, and sponsored by FTWW, this year and in 2016. All resources, including endo information leaflets, were funded by the kind donations of our members and supporters. If you would like to make a donation to help us in our awareness-raising efforts, find out more – here. See our Instagram and YouTube for more highlights from the day. 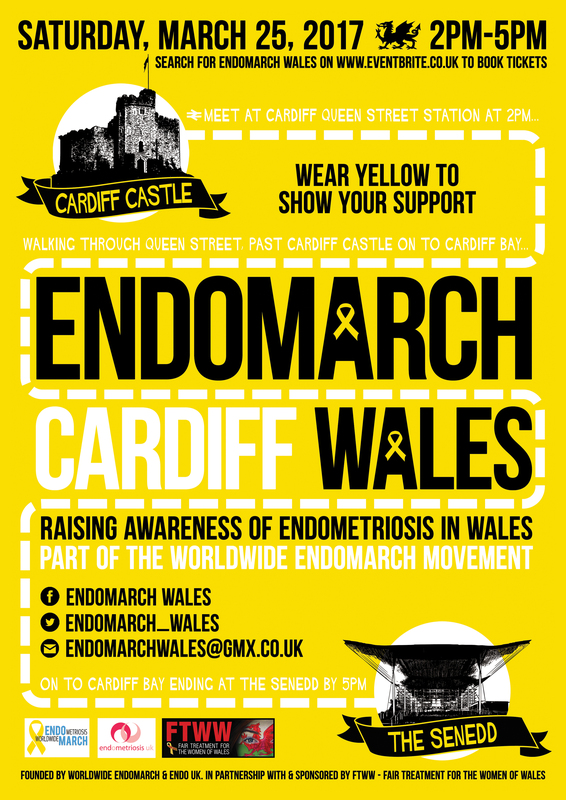 For updates follow the dedicated Twitter and Facebook pages, and look out for #EndoMarchWales #EndoMarchCymru on social media!